If the rumored MegaMan Anniversary project is true then, then we might get either MegaMan Battle Network Anniversary collection since we all know how popular that series is, or a brand new MegaMan series. Plus, Mavrel VS Capcom 3 is getting a Super version like Super Street Fighter 4? Not that I'm a big fan of fighting games, the controls for fighting games are too fricking hard save for Smash Bros series which has easy controls. I wonder what kind of Incarnation of MegaMan we will be seeing? 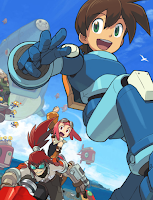 Star Force MegaMan and Battle Network MegaMan may have been ruled out, so we might get Classic, X or Legends MegaMan. Has Dash 3 gotten enough publicity, beyond the Devroom, for the "Big Announcement" not to be Dash 3? We're a Megaman community, so we've known about this for ages, but what about the "press" and the general public? Lupinko actually has hinted at the existence of a Super Marvel VS Capcom 3. He even hinted at some point during mid-April that it is exactly what it is called (said something like 'Super Marvel VS Capcom 3? Seriously, Capcom? '), but deleted that tweet soon afterwards (probably because CapCops are likely out in full force looking for his source by now). Well, it's good to hear that something Mega Man-related is actually going to show up at this year's E3, unlike last year. All but one of the things listed sound promising. At this point, I don't think I even need to explain which one I'm talking about. i would love to see an updated mega man classic collection for modern systems... if for no other reason than to have achievements in 1-6. 25th anniversary seems as good a time as any. Super Marvel VS Capcom 3 = MvC3 with downloadable content available from beginning? A 25th anniversary project? If it has nothing to do with the REAL MegaMan, then it's not much of an anniversary, is it? Then again, maybe they'll be unveiling a makeover for MegaMan to suit Capcom's PS3/360-friendly corporate mentality. If you thought Mega looked bad on the NES cover of MM1, wait till you see him get the Bomberman: Act Zero treatment. I'm not hyped for MegaMan 2 3D, now... if Capcom wanted to publish MegaMan 2.5D, then they'd have me on the hook. Downlable content for super marvel vs capcom 3? I really hope it's the star force megaman. The other stuff looks interesting, though I really hope MvC3 doesn't get a "Super" version, and just gives out a lot of new updates. There hasn't even been any new alt-costumes for the rest of the damn cast. I prefer to have TvC2 and/or MvC4 as an actual sequel over Super MvC3 as an update to MvC3. mega man should have been in mvc3 from the start. Good news! It turns out that MegaMan Legends 3 Prototype will be at E3 this year, I just checked the site at Gamespot and everything. I could be wrong though. According to Capcom's live feed plan, there will not be ANYTHING Mega Man related at E3. I am very dissapointed Capcom. @turianx9: That doesn't necessarily mean Marvel vs Capcom 3 stuff is ruled out, nor a Tatsunoko vs Capcom sequel. It just means the franchise itself won't have any of its own games. Then again, when was the last time any new Mega Man game was announced at E3? Point being, I think we have to wait until TGS. Which is like three months from now. Although the Rockman Unity twitter is going crazy about something at the moment, something on the 3DS shop that doesn't seem to be related to Legends 3. Could be something that we already knew about and that I'm forgetting, though. He's going bonkers for Rockman World on the eShop. Japan only for the time being. I just want something that I can play, damnit!! Well, we didn't get a Super MvC3. We got a new Super Smash Bros. instead. Well E3 is almost over and still haven't heard anything Rockman related. Maybe Capcom has given up on him. I sure hope we hear something, but knowing Capcom, they'll wait to make any major Mega Man announcements until Comicon or Tokyo Game Show. They very rarely announce anything MM related at E3 anymore.